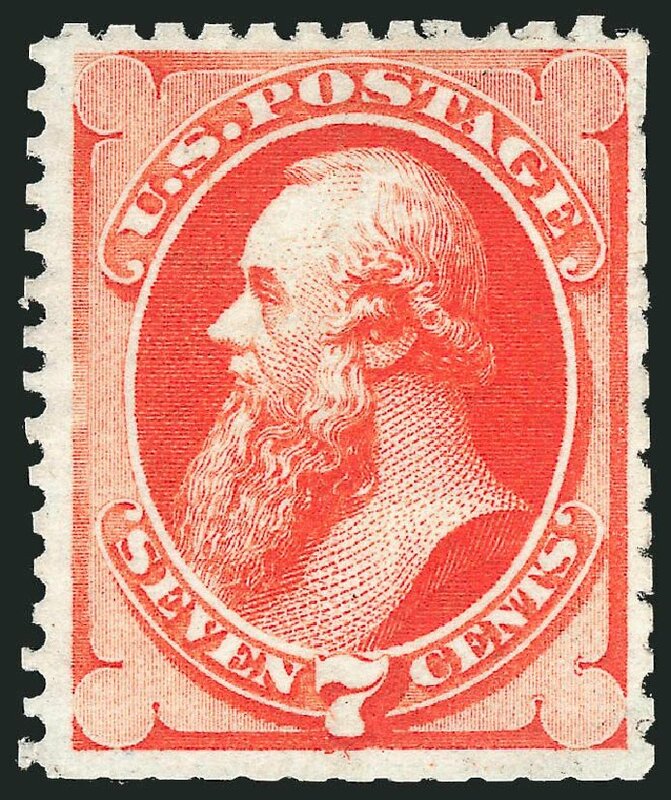 USA (Scott 171) 1875 SPECIAL PRINTING 1873 STANTON 7¢ RED VERMILION An unusually well-centered genuine Special Printing with beautiful, radiant color. Tough issue, extremely fine. Typical scissor cut perfs at left. Unused, no gum as issued, light pencil marks on back. (2002 PF Cert #0382819 & 1950 PF Cert #2488) Cat $5000. 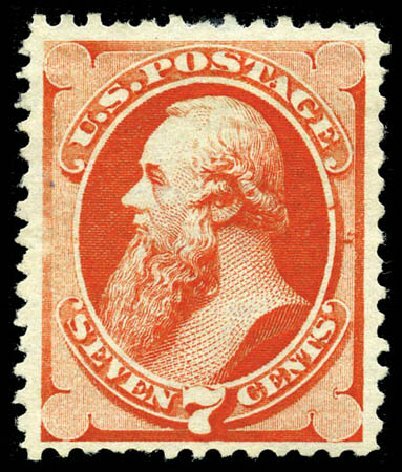 7c Reddish Vermilion, Special Printing (171). Without gum as issued, radiant color, full and intact perforations on all sides FRESH AND VERY FINE EXAMPLE OF THE 7-CENT 1875 CONTINENTAL BANK NOTE COMPANY SPECIAL PRINTING. Our census of Scott 171 contains 70 certified examples plus one uncertified copy. 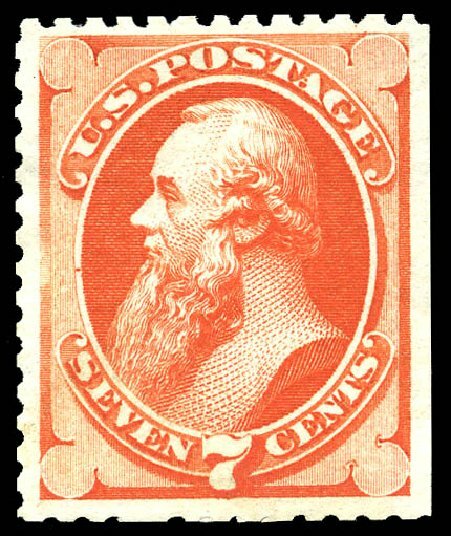 Most stamps were scissors-separated, affecting the perforations on at least one side. Census No. 171-UNC-34. P.F. certificate nos. 1571, 25968 and 193634 (all as sound) no longer accompany. With 2008 P.S.E. certificate. 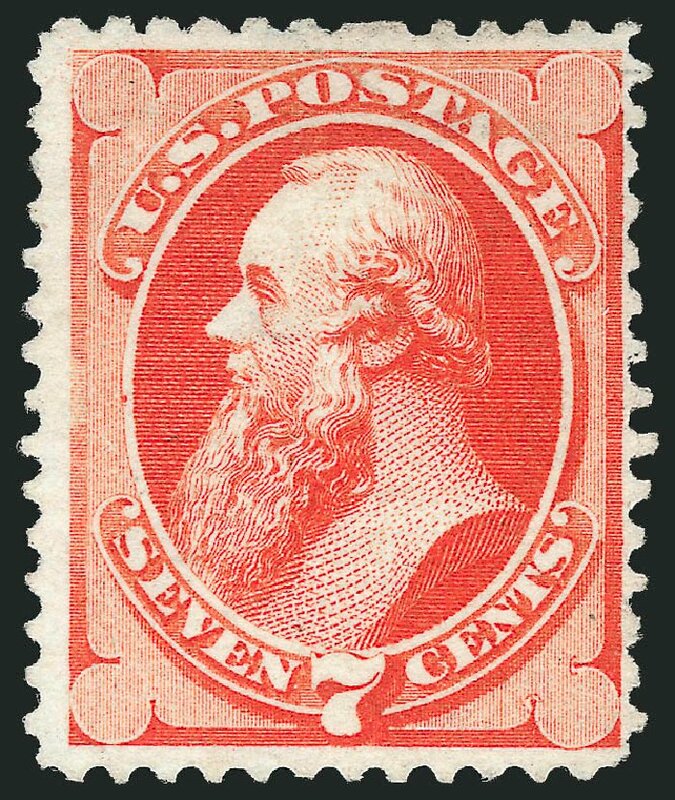 1875 Special Printing, 7¢ reddish vermilion. Without gum as issued, deep rich color, well centered with full perforations all around, Extremely Fine, ex Engel, with 1947 A.P.S. and 1958, 1992 and 2004 P.F. certificates. Scott No. 171; $5,250. WITHOUT QUESTION ONE OF THE FINEST EXAMPLES OF THE 1875 7¢ CONTINENTAL SPECIAL PRINTINGS EXTANT. Nearly all the Continental Special Printings where separated by scissors affecting perforations on at least one side. This stamp with full perforations is one of the few that escaped this procedure. It is believed that approximately 75 examples of this Special Printing exist. 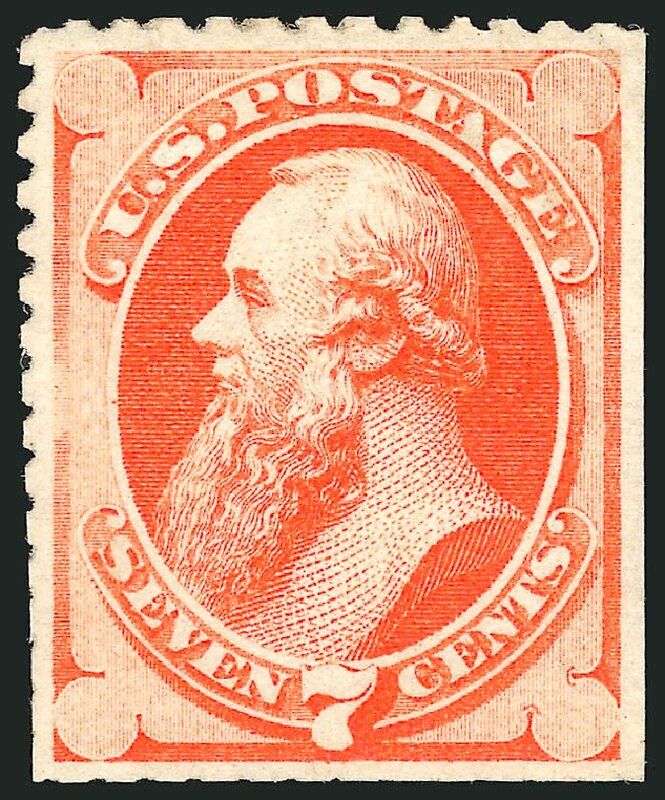 7c Reddish Vermilion, Special Printing (171). Without gum as issued, radiant color, scissors-separated as usual but with intact perforations on all sides VERY FINE AND CHOICE EXAMPLE OF THE 7-CENT 1875 CONTINENTAL BANK NOTE COMPANY SPECIAL PRINTING. Our recently updated census records for Scott 171 contain 70 certified examples. 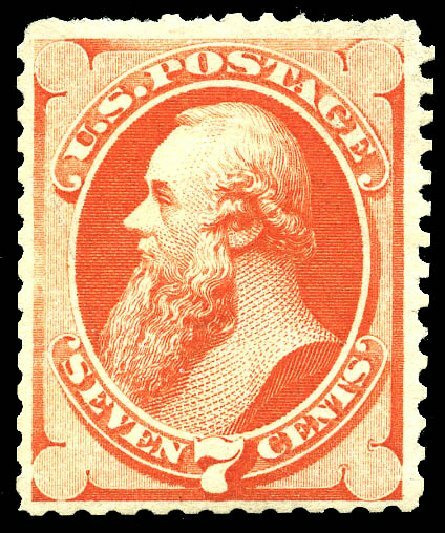 Most stamps were scissors-separated, affecting the perforations on at least one side and in some cases two or three sides. The stamp offered here, with virtually intact perforations on all sides, superb centering, and remarkably vibrant color is, in our opinion, a great condition rarity. Unpublished Census No. 171-UNC-29. With 1976 and 2013 P.F. certificates. 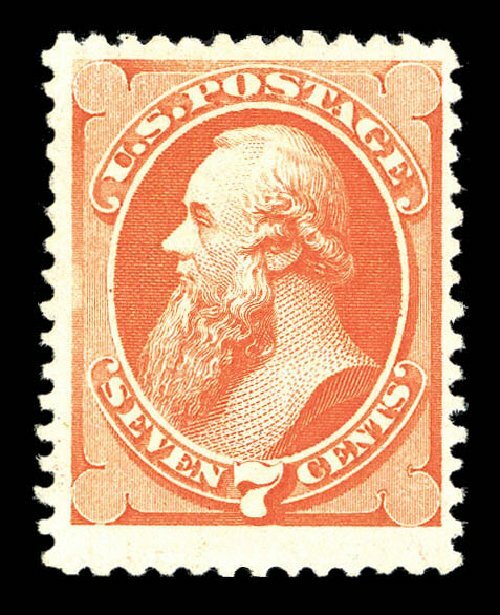 * 7¢ reddish vermilion, 1875 Special Printing (Scott 171), without gum as issued, very well centered with exceptionally brilliant color, neatly scissor-separated leaving perforations intact on three sides, fresh and Extremely Fine (photo). $5,250 A CHOICE EXAMPLE OF THIS RARE STAMP, LESS THAN 75 BELIEVED TO EXIST. Expertization: 1957 and 2003 P.F. Certificates. Provenance: Chapin. 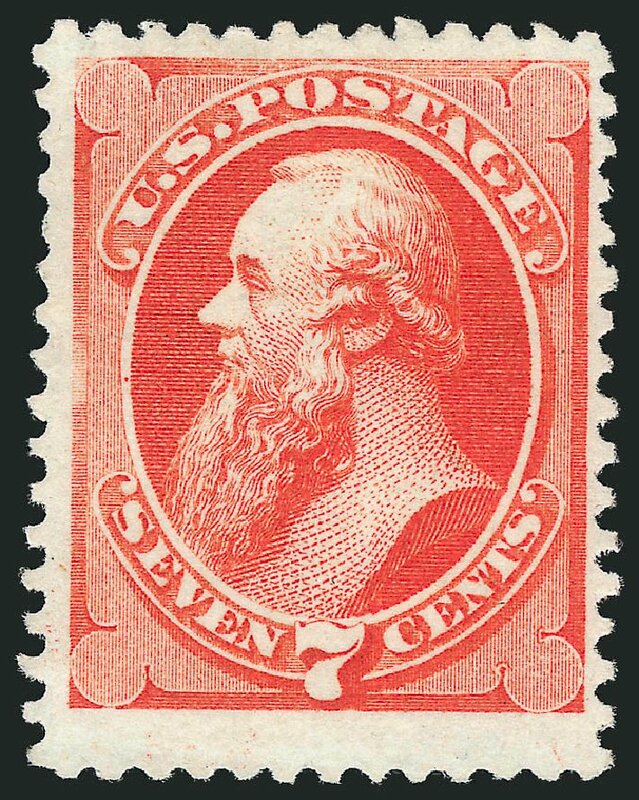 * 7¢ reddish vermilion, 1875 Special Printing (Scott 171), brilliant color, quite well centered, without gum as issued, pulled perforations and a few reduced at top after certificate, Very Fine (photo). $5,250 ONLY ABOUT 75 OF THIS RARE SPECIAL PRINTING ARE BELIEVED TO EXIST. Expertization: 1955 P.F. Certificate. 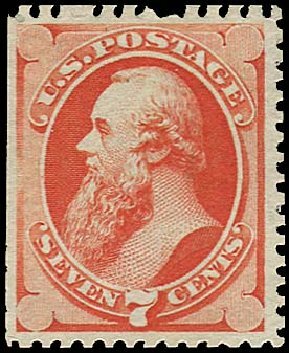 7c Reddish Vermilion, Special Printing (171). Without gum as issued, radiant color, full perfs at top and left, scissors-separated but nearly intact perfs on all four sides VERY FINE EXAMPLE OF THE 7-CENT 1875 CONTINENTAL BANK NOTE COMPANY SPECIAL PRINTING. Our recently updated census records for Scott 171 contain 72 copies. Many examples were separated by scissors, and so are often found with perforations partly missing or entirely trimmed away. Unpublished Census No. 171-UNC-03. With 1992 P.F. certificate. 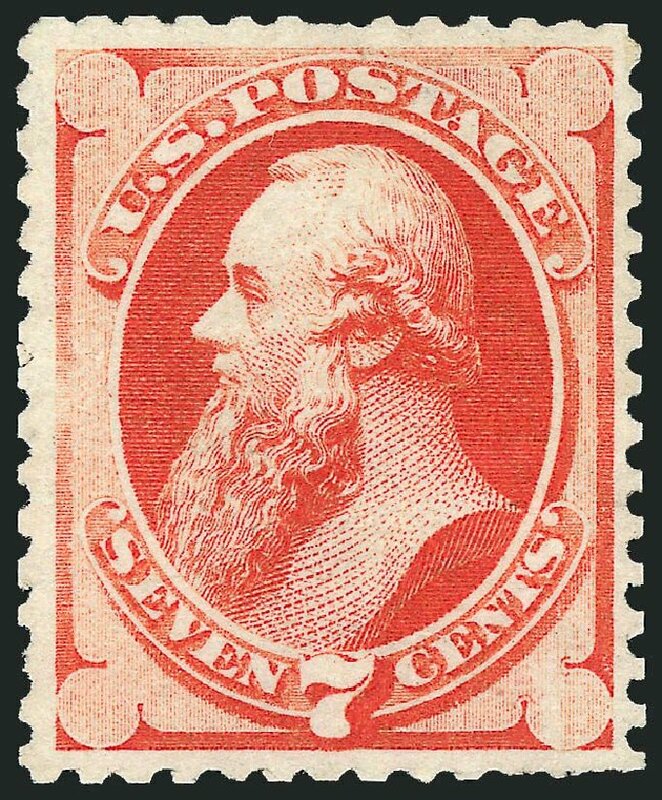 1875 Special Printing, 7¢ reddish vermilion (171), without gum as issued, extremely handsome seven cent Special Printing, featuring near perfect centering, huge boardwalk margins, and fabulous bold color, GEM appearance that would enhance any great collection; small sealed tear at top, and a light diagonal crease at top left, otherwise Extremely Fine, approximately 70 examples are known to exist, 2011 P.S.E. certificate, and 1954 and 2013 P.F. certificates. Scott $5,250. Estimate value $2,500 – 3,500. 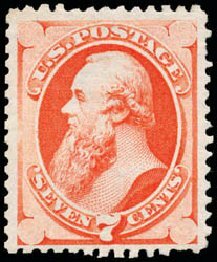 7c Reddish Vermilion, Special Printing (171). Without gum as issued, radiant color, full and intact perforations all around, unusually choice centering EXTREMELY FINE. A PHENOMENAL EXAMPLE OF THE 7-CENT 1875 CONTINENTAL BANK NOTE COMPANY SPECIAL PRINTING. Our recently updated census records for Scott 171 contain 72 copies. Many examples were separated by scissors, and so are often found with perforations partly missing or entirely trimmed away. Perhaps a half-dozen are confirmed as sound and centered. Unpublished Census No. 171-UNC-47. With 1997 P.F. certificate. 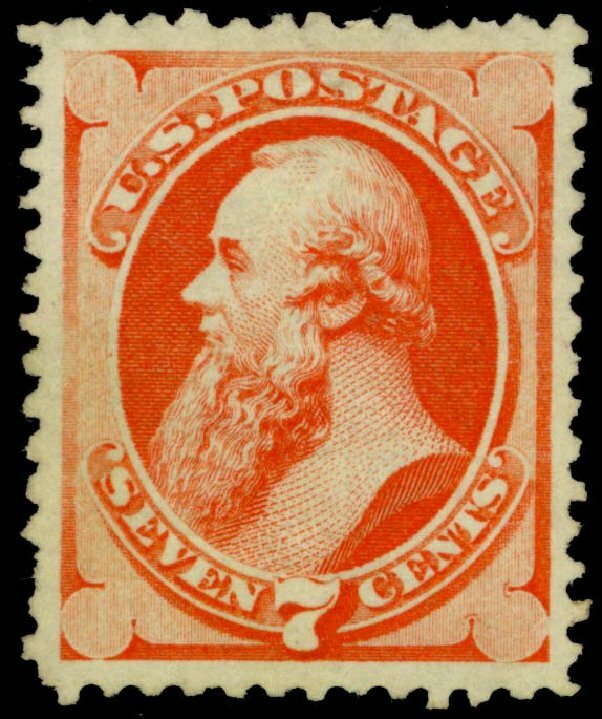 7c Reddish Vermilion, Special Printing (171). Without gum as issued, full perforations on all sides and “No. 2(2)” of imprint in selvage at top, brilliant color VERY FINE AND CHOICE. THIS IS THE ONLY RECORDED EXAMPLE OF THE 7-CENT 1875 CONTINENTAL BANK NOTE COMPANY SPECIAL PRINTING WITH ANY PART OF THE PLATE NUMBER. Many examples of the Continental Bank Note special printings were separated by scissors, and so are often found with perforations partly missing or entirely trimmed away. Our recently updated census records for Scott 171 contain 72 copies. This was the righthand stamp in the Earl of Crawford top selvage strip of four with part plate number and part imprint. This strip was spared the usual fate of scissors-separation. Ex Earl of Crawford and Ackerman. 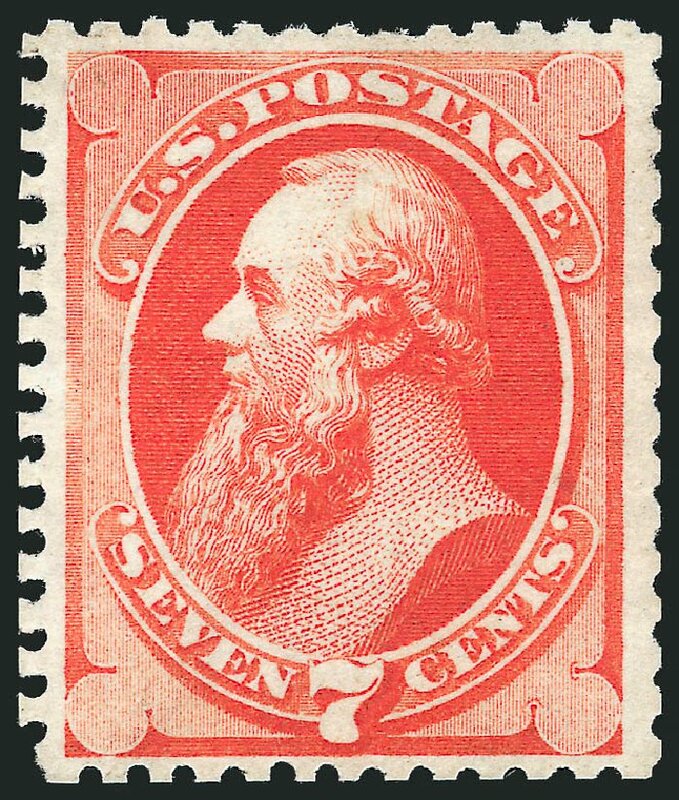 1875 Special Printing, 7¢ reddish vermilion (171), nicely centered with large margins, incredibly deep, rich color and full, intact perforations, without gum as issued, wonderfully fresh and Fine. Scott $5,500 AN EXCEPTIONAL 7¢ CONTINENTAL SPECIAL PRINTING WITHOUT THE USUAL SCISSOR SEPARATED PERFORATIONS; ONLY ABOUT 70 EXAMPLES ARE RECORDED. Expertization: 2008 PSE Certificate graded F 70J. 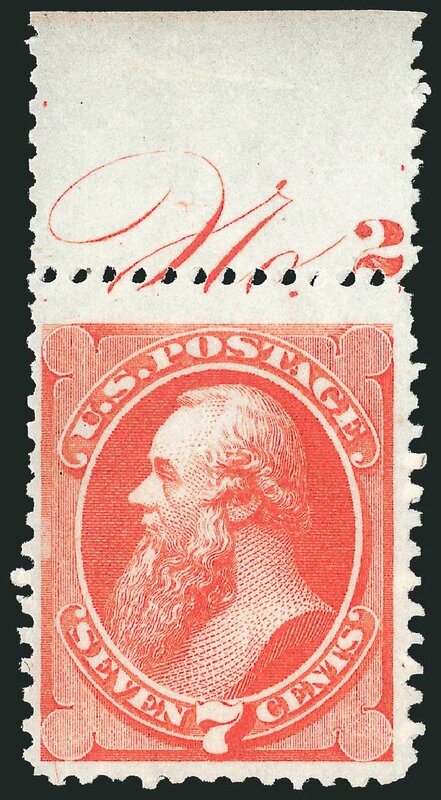 1875 Special Printing, 7¢ reddish vermilion (171), fresh and exceptionally well centered with full perforations (few slightly short/improved at top) and vibrant color, without gum as issued, faint, tiny thin spot (not mentioned on accompanying certificate), owner’s handstamp on reverse barely shows through, otherwise Very Fine. Scott value $5,500 OUTSTANDING CENTERING AND THE FACT THAT ITS PERFORATIONS ARE NOT SCISSOR-CUT, MAKE THIS ONE OF THE MORE ATTRACTIVE EXAMPLES EXTANT OF THE 7¢ CONTINENTAL SPECIAL PRINTING, ONLY ABOUT 80 OF WHICH ARE RECORDED. Expertization: clear 1961 PF Certificate.